Empire of the Sun , by J.G.Ballard, Gollancz 1984, 278pp. Usually Jim would have paused to observe the crowd. On the way home from school Yang would often drive by the Old City. The public stranglings were held in a miniature stadium with a scrubbed wooden floor and rows of circular benches around the teak execution posts, and always attracted a thoughtful audience. The Chinese enjoyed the spectacle of death, Jim had decided, as a way of reminding themselves of how precariously they were alive. They liked to be cruel for the same reason, to remind themselves of the vanity of thinking that the world was anything else. Ballard is quite bleak in depicting himself as the boy he was. Several of us liked the scene in which Jim disguises a sweet potato down his trousers as a hard-on for Mrs. Victor (I had forgotten she is played by the wonderful Miranda Richardson in the movie). He has uncomfortably shared a cubical with her and her husband and child throughout the internment, and when they leave, he returns to lie on the bed and smell her scent. From the movie, I had a strong memory of the stadium full of loot, but not of Basie encouraging the Chinese warlord to kill Jim. The dangerous period between the opening of the camp and the actual arrival of the Americans, with the "bombs" loaded with rich food and magazines, was especially vivid. As I dozed on the train from Cambridge (which Ballard calls "that academic theme park") to meet at Conrad's Soho apartment for book-club, I figured I may as well read the Guardian article that Tim had forwarded. My eyes nearly popped out of my head as I read that Ballard had not been separated from his parents during the war! All that yearning to be with them -- one of the few wholesome emotions in the book -- was, well, fiction. No wonder the reunion, as Tim commented, rang false. And how much more horrible it must have been, to be in that cubicle with one's own helpless parents, no longer able to "pull those little levers of promise and affection with which parents negotiate domestic life with their children". Wow. I bought the DVD of the movie just now, but have only watched the "making of" video so far. The narration is full of crap like "one boy's odyssey into manhood." The story is far more complex than that, and I remember Spielberg doing it justice, though I will watch again and see. Shanghai is such a fascinating place, both for a bibliophile and for travelers. 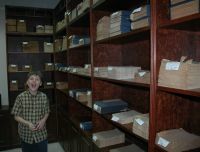 I could spend a fortune on EBay on Shanghai books and memorabilia -- they are well bid there. One of my earliest internet book purchases was a self-published memoir of the city by three sisters, titled Stone-Paper-Scissors. Alas, it was a bit hermetic and for all of being set in China felt more like Borehamwood. But I did like China to Me by Emily Hahn, and Shanghai Lawyer by Norwood Allman, and I have a few great oddities like Pickwickians Abroad . A search says that Amherst Avenue is now Xinhua Lu -- I'd have made a pilgrimage there with Griffin had I known. And again on Google Earth, look how close Lunghua airfield is -- can that be right?